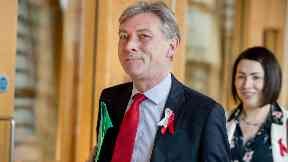 Richard Leonard: Said Labour was awakening its 'spirit of audacity' (file pic). The upcoming European election must not become a "false choice" between British and Scottish nationalism, Scottish Labour leader Richard Leonard has said. Speaking at the Scottish Trades Union Congress conference in Dundee on Monday, Leonard also said his party is reawakening its "spirit of audacity" and urged voters to get involved to defeat the "right wing patriotism" of Nigel Farage. After EU leaders granted a further extension to Article 50 until October, parties are gearing up for elections to the European Parliament ahead of voting next month. Leonard told the conference: "Do not allow this election to become a false choice between competing nationalisms: British and Scottish. "Do not simply be a voter. Be an activist. Join the campaign to defeat the right wing populism of Farage and UKIP, and help build a movement for radical reform and real change in the European Union as part of the Party of European Socialists alliance. "We have got a world still to win. We are offering people hope again. Hope that there is an alternative to austerity that we can start building again. Building a full employment economy and a truly equal society. "Hope that we can end the economics of privatisation and outsourcing and bring modern public services into public ownership, and hope that we can see a meaningful redistribution of not just wealth but power. "We are rediscovering our sense of injustice. Reawakening our spirit of audacity. So my call to you is to join us - join us in that philosophy of hope. That movement for democracy. This drive for socialism. "Because we know that if we do that as a movement, both wings working together, nothing and no-one can stop us." In his speech, Leonard also outlined his vision for a Scottish Labour government, pledging that he would appoint a cabinet secretary for labour in order to protect and strengthen workers' rights. Leonard added that the party would call for a devolution of employment law in order to set a pre-Brexit floor to ensure that workers in Scotland would not be caught up in a "race to the bottom", as well as reiterating proposals for free bus travel, a £10 living wage and a ban on zero-hour contacts. The SNP's Tom Arthur MSP called Leonard's address "perplexing". He said: "This was a perplexing speech, in which Richard Leonard tried to pretend he's not a Brexiteer like Nigel Farage. "The fact is that he's happy to lay waste to Scottish jobs by crashing our economy out of the EU and its single market, which is eight times the size of the UK alone." Arthur added: "The SNP will always welcome support for further devolution of key powers to Holyrood - but it's hard to understand why Labour want to stop at employment law when transferring all economic levers to Scotland could truly help us to transform our economy, stop the damage of Brexit and create jobs. "Besides, people will remember Labour fought tooth and nail against devolving these powers in the wake of the 2014 referendum, despite promising 'near federalism' in the desperate last days of the campaign."